At my father's funeral, I went around and took one flower from every arrangement and made my own small bouquet. I thought it was quite beautiful. 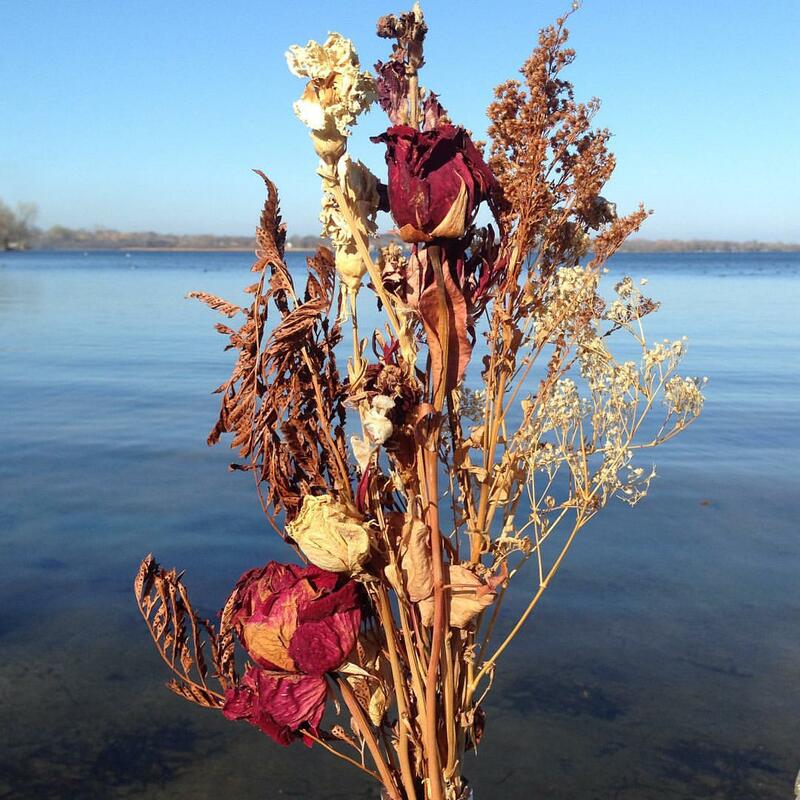 As months went on, I realized I had eventually ended up with a nice arrangement of dried flowers, and at some point, decided I would keep them for a year and then put them on my dad's grave or something else that occurred to me. I wasn't sure if maybe I'd put them in water, because he loved water so much or in our lake specifically, or just on the grave. I wasn't really sure what I'd do. I hurt my leg the day we were supposed to go up as a family, so I kept the flowers a little longer. I need to get rid of my car (where they've been riding around with me), and it seems like it's time to make a decision. Honestly, the bouquet still looks nice, but I'm afraid that if I don't let go of it now, I never will -- my hoarding tendencies are already well-established with anything -- and I've always thought it odd/morbid when people hang on to ashes or certain things too long. That person isn't in an urn. So, I took some pictures and stuck him* in the pole at the end of the pier. Seemed to make the most sense. Love you, Dad. *Ha! I said stuck "him" in the pole. Oh, well. IT. I stuck IT in the pole. But it was sort of a personification of this thing I was carrying around -- something that represented him in *some* way, I guess. But those flowers definitely are NOT my Dad. Thus, why I guess I felt I should let them have their day in the glorious fall sun.